Philanthropy is both timeless and timely. Ancient Romans, Medieval aristocrats, and Victorian industrialists engaged in philanthropy, as do modern-day Chinese billionaires, South African activists, and Brazilian nuns. Today, philanthropic practice is evolving faster than ever before, with donors giving their time, talents, and social capital in creative new ways and in combination with their financial resources. These developments are generating complex new debates and adding new twists to enduring questions, from "why be philanthropic?" to "what does it mean to do philanthropy ‘better’?" Addressing such questions requires greater understanding of the contested purpose and diverse practice of philanthropy. 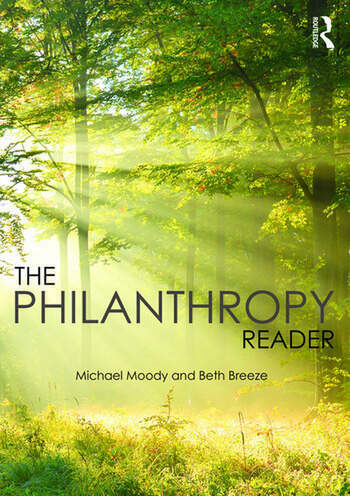 With an international and interdisciplinary focus, The Philanthropy Reader serves as a one-stop resource that brings together essential and engaging extracts from key texts and major thinkers, and frames these in a way that captures the historical development, core concepts, perennial debates, global reach, and recent trends of this field. The book includes almost 100 seminal and illuminating writings about philanthropy, equipping readers with the guiding material they need to better grasp such a crucial yet complex and evolving topic. Additional readings and discussion questions also accompany the text as online supplements. This text will be essential reading for students on philanthropy courses worldwide, and will also be of interest to anyone active in the philanthropic and nonprofit sectors — from donors and grantmakers, to advisers and fundraisers. Section I: What is Philanthropy? 1. Why Philanthropy Matters 2. Contested Definitions of Philanthropy 3. Different Lenses for Studying and Explaining Philanthropy 4. The Balance of Public and Private in Philanthropy Section II: Philanthropy Across Time and Place 5. Complex History 6. Contested History 7. Continuity and Change Across Eras 8. The Role of Religion, Race, Gender, and Geography Section III: Being a Philanthropist – Callings and Critiques 9. Why Should People Give – Religious and Secular Calls 10. Why Do Wealthy People Give – Elite Donor Statements 11. Critiques of Elite Donors 12. Philanthropy Versus the Alternatives Section IV: Philanthropists and Beneficiaries – A Complex Relationship 13. Giving and Receiving 14. Philanthropy as a Type of Gift 15. When Philanthropic Gifts Go Wrong 16. Being a Giver, Being a Recipient 17. What is the Right Relationship Between Those Who Give and Those Who Get? Section V: Philanthropic Practices and Institutions 18. The Practice of Asking, The Practice of Granting 19. Foundations – Roles and Critiques 20. Should Corporations Give? 21. New Methods and Blurring Boundaries Section VI: Debates About Making Philanthropy Better 22. On Philanthropic Decision Making 23. How Do We Know If Philanthropy Does Any Good? 24. New – Or Not So New – Ways of Improving Philanthropy 25. Is "Being Effective" the Only Worthwhile Yardstick? Michael Moody is Frey Foundation Chair for Family Philanthropy at the Johnson Center for Philanthropy at Grand Valley State University, USA. He is co-author of Understanding Philanthropy: Its Meaning and Mission and writes and speaks about philanthropy, donors, and giving to both scholarly and practitioner audiences. Beth Breeze worked as a fundraiser and charity manager before founding the Centre for Philanthropy at the University of Kent, UK, where she now conducts research and teaching on philanthropy and fundraising. She produces the annual Million Pound Donor Report and co-authored Richer Lives: why rich people give.